Payasam and Malayali go hand in hand. “Payasam”, also known as “kheer”, the basic ingredients being milk or coconut milk and rice, wheat or lentils. It is usually sweetened with sugar or jaggery depending on the kind of payasam being made. This is a traditional Ramdhan special payasam during ifthar or nombuthura. 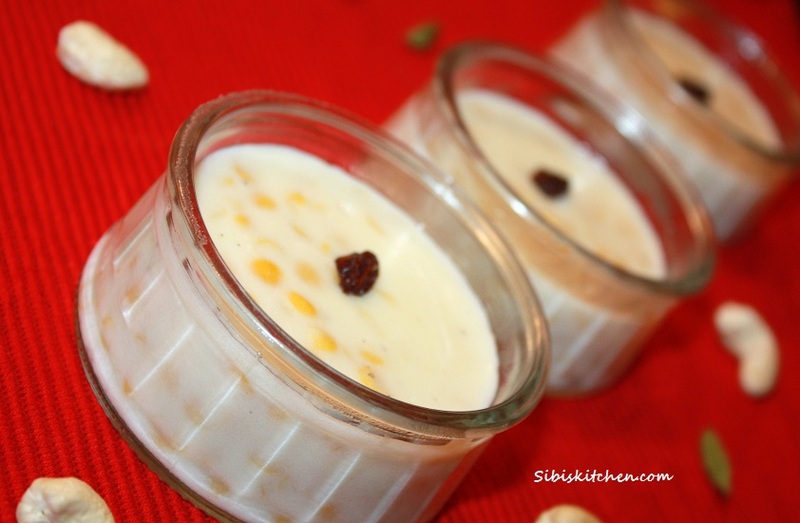 Yet another exotic payasam recipe that comes with love from the world of Malabar cuisine. 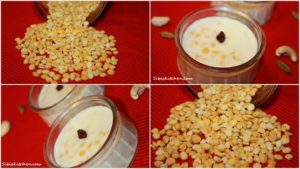 1.Soak the chana dal for 2 hours in water and then cook it in two cups of water until soft. Make sure it doesn’t overcook to a paste. 2.Grind the grated coconut with enough water to make two cups of thick coconut milk (first extract) and two cups of thin coconut milk (second extract). 3.Boil the second extract coconut milk with sugar, split Bengal gram and a pinch of salt. 4.Dissolve a table spoon of rice flour in a little water and add to the mixture. Keep stirring to avoid lumps. 5.Add in the freshly ground cardamom powder and let the payasam simmer for a while. 6.Now, add in the first extract of the coconut milk and stir. Serve it warm or chilled. Note: The same payasam can be made with regular cow’s milk. If you want to avoid coconut and cut down on the saturated fat, low fat milk is a good option as well. 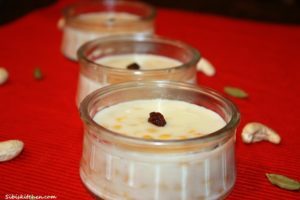 The richness and taste of the payasam depends on the fat content like any other desserts. Chickpeas are a helpful source of zinc, folate and protein. They are also very high in dietary fiber and hence a healthy source of carbohydrates for persons with insulin sensitivity or diabetes. Chickpeas are low in fat and most of this is polyunsaturated. Nutrient profile of desi chana (the smaller variety) is different, especially the fibre content which is much higher than the light coloured variety. One hundred grams of mature boiled chickpeas contains 164 calories, 2.6 grams of fat (of which only 0.27 grams is saturated), 7.6 grams of dietary fiber and 8.9 grams of protein. Chickpeas also provide dietary phosphorus (49–53 mg/100 g), with some sources citing the garbanzo’s content as about the same as yogurt and close to milk.